Q: What does the hundredth century mean to you? A milestone, of course. A major milestone. There was some pressure from all quarters about getting this hundred. I had to work really hard to reach there. The hundredth century has taught me to never take anything for granted. It tested my patience, dedication and will power to succeed. I must admit that there were some frustrating moments as well. But, my family and my friends constantly inspired me. Stung by the upset defeat against minnows Bangladesh, India will be under immense pressure when they go into their must-win last Asia Cup league match against arch-rivals Pakistan here tomorrow with bowling in the slog overs continuing to be a big worry. As was expected, Sher-e-Punjab and Bhopal Badshahs played out a high-octane affair at the Olympian Surjit Singh hockey stadium here tonight. The 32nd match of the ongoing World Series Hockey (WSH) saw a young Bhopal side square off against seasoned campaigners from the home team. McLaren's Lewis Hamilton claimed pole position in the eventful qualifying session of the season opening Australian Grand Prix here Saturday. I learnt a lot from everyone — my parents, siblings and my wife. They had given me the finest education, I believe. Q: Did any point of time you lose self belief in the last 33 innings since your 99th hundred? Never. I knew it would come surely. I just kept working at the nets. There was no lack of effort and commitment. (Laughs), I have not got over fully the feeling of getting the hundredth hundred. Let it sink in. We have got a major match against Pakistan in the next 24 hours. We all have to really play well to beat Pakistan and stay alive in Asia Cup. Q: Among these 100 hundreds, any special hundred for any special reason? There are quite a few for different reasons obviously. But for me, each and every one was special. Yet, the one against England in Chennai was really very, very satisfying for me since it came just after the terrorist attacks in Mumbai. The whole nation was sorry. People lost their near and dear ones, the loss was irreplaceable. We needed to do something. As a team we wanted to gift a memorable performance to our countrymen. I sincerely thanked the England cricket team and their board because they were brave enough to come to our country again. Q: Dhaka has always been a favourite hunting place for you. You had scored your 34th Test hundred at the Bangabandhu Stadium in December 2004. Yeah, I was delighted to do so. In fact, I was honoured to equal the feat of Sunil Manohar Gavaskar. When we started playing, 34 Test hundreds was ‘the’ monumental feat for all batsmen. I had never thought about equalling it. And before I emulated the feat, the situation was almost similar. Everywhere I went, people wanted to know when the 34th was coming. I was constantly being reminded of that hundred, like the one I got here yesterday. And that took some frustrating days as well - between the 33rd and 34th. So, when I scored that, I was really relieved. And Mr. Gavaskar made it special for me when he congratulated me on the ground. Q: You had always said you don’t like to set targets. But when all these things were not in such a place, when you were just a youngster, did not you set a goal before yourself to play for the country? That was always a dream to represent my country in international arena. I started playing first class cricket at 15 and then that was the dream for me. It was not at all ‘setting a target’. It was ‘chasing a dream’. I just wanted to be a Test cricketer. When you play for your country for more than 21 years, you are bound to break some records or feats. But even today, the prospect of playing another Test match excites me. I find the same excitement before the toss. With the passage of time, I grew mature. But playing cricket still is the best enjoyment for me. When I was forced to stay away from cricket for some injuries, I really hated those days. Q: In your illustrious career, you were always against having a runner. Any special reason? Not really. But what led me not to ask for a runner was purely cricketing reasons. As a batsman, only I know it how did I hit the ball, where should it go and when. A batsman, after hitting the ball, is the best judge of a run, not the runner. And I never wanted to take any risk there. For me cricket is a religion. I wanted to give my best for those 6-7 hours on the field and was ready to take the consequences gladly. Nothing more, nothing less. Q: Do you see yourself as an entertainer who has some obligation towards people who are coming to the ground spending from their own pocket just to see you? Well, fans are our biggest support. Without them, the game cannot survive. It’s because of them the game has attained such a great height in India. But, to be honest, when I am out there in the middle, I have nothing but the interest of the team in my mind. For me, it would be a distraction if I keep them in mind when I’m batting. I have to concentrate more on the job at hand and do the best for my country. That demands ultimate concentration. So, I cannot think about what’s happening outside. Q: How do you react to criticism? Playing for the country is the greatest motivation for me and I am ready to give my hundred per cent whenever I am asked to take the field. I know there are some people who really want me to do better and they have my phone number. So, they can communicate with me easily. Can I explain every individual what I was doing there? Is it possible? I am not interested either. You can think about the things which are in your hand, in your control. You cannot succeed every time you are out there. Neither can you please everybody. That’s against the law of nature! So, I take it as they come and try to do what the team has assigned me to do. Q: Have you ever thought about life without cricket? Not really! As I had told earlier, that it was really painful for me to stay away from the game when I was injured. See, I started playing when I was 5 and in the following 32-33 years I had done nothing but playing cricket, is not it? I have faced four generation of great bowlers in the history of the game. It’s really difficult for me to think about life away from cricket. I love the game, I love it more to play the game. Just playing the game gives me the highest amount of pleasure. Q: What do you do first when you reach the crease? The first thing I do is to watch the field-setting. See, this is the age when everyone knows a thing or two about the opponent and their strategies. You have to keep in mind everything — the bowler, the field-setting, the strategies - both of the opponent and of your own team. The surface, how does it behave, is another thing you need to keep in mind. Q: What are the things required to become a Sachin Tendulkar? You need to have a dream first. Dedication, discipline and commitment to the game are the other things. You need to be a good student of the game which, perhaps, I was not when I started playing the game. I still remember the day when my brother Ajit took me to (Ramakant) Achrekar’s school. 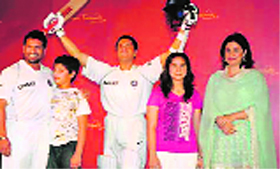 If I was not taken there, I might not have become Sachin! It was all within the family. I learnt a lot from everyone — my parents, siblings and my wife. They had given me the finest education, I believe. England in Chennai was really very, very satisfying for me since it came just after the terrorist attacks in Mumbai. we wanted to gift a memorable performance to our countrymen. The Indians have no option but to put it across their traditional rivals to stay alive in the tournament as the shock defeat against Bangladesh has thrown their campaign into jeopardy. The stunning defeat against Bangladesh would have certainly hurt the Indians, especially Sachin Tendulkar whose phenomenal feat of scoring the 100th international ton went in vain. But they have to regroup quickly and put the debacle behind them. Pakistan, on the other hand, have already secured a berth in the final with victories over Bangladesh and Sri Lanka and will be under less pressure unlike the Indians. The Indians have generally managed to lift their game when they take on their bitter foes and it remains to be seen whether Mahendra Singh Dhoni and his men can upstage the Pakistanis in what promises to be a thrilling contest under lights at the Sher-e-Bangla National stadium. 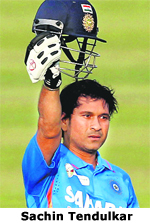 Now that Tendulkar has completed the historic 100th international century after a frustrating year-long wait, the champion batsman will be mentally more relaxed and that could allow him to play more freely. Tendulkar has a good track record against Pakistan and will be determined to make an impact tomorrow. While the Indian batting has done reasonably well in the Asia Cup after struggling on the bouncy Australian tracks, it is the bowling which has been a cause of concern. The pacers — Praveen Kumar, Irfan Pathan, Vinay Kumar — have not been consistent enough in the death overs on these flat sub-continental tracks while the spinners like R Ashwin and Ravindra Jadeja have been patchy. The Indians have to quickly sort out their bowling woes as any mistake tomorrow could see the team bowing out of the tournament. Despite the inconsistent show by the bowlers, Indian captain Dhoni said he has faith in them and that they would learn from their mistakes. "The bowlers have talent, it is there. They just need to execute plans with consistency. The youngsters will learn more. They will start performing. They felt the pressure in the game against Bangladesh," Dhoni said. "They (Bangladesh) played better cricket throughout. They began well and capitalised on that. They made sure they spent time on the crease. At the start of the Powerplay our bowlers felt the pressure and crumbled. A a bit more runs on the board would have been better," Dhoni said. The final result went in Punjab’s favour (4-3). After a dull first quarter, the home team made the most of their opportunity and scored the first goal. Former international goalkeeper Baljit Singh managed to stop a shot by Harpreet Singh off a penalty corner but Inderjeet Singh Chadha, standing right next to him, smartly placed the ball into goal in the 35minute. After the first goal, the visiting side lost their grip and conceded two goals within a minute. Mandeep Antil and Gagan Ajit scored in the 41st and 42nd minute, respectively. The Bhopal outfit scored their first goal in the 46th minute through Casey Henwood, who managed to beat goalkeeper Sukhjit after lopping the ball above him. But in 58th minute Hotchiks made it 4-1. Lalit Kumar Upadhaya reduced the margin in the 67th minute. Later in the 69th minute, Shaielnder Bundela converted awarded penalty corner to close the match at 4-3. McLaren's Lewis Hamilton claimed pole position in the eventful qualifying session of the season opening Australian Grand Prix here Saturday. Nico Hulkenberg of Sahara Force India was ninth fastest while HRT's Narain Karthikeyan could miss Sunday's race after failing to record the qualifying time. It was a dream start for the McLaren team with Hamilton and Jenson Button settling the front row. Hamilton's fastest lap was 1:24.922 while Button's was 1:25.074, ahead of Romain Grosjean, who finished a surprise third in his Lotus with 1:25.302. Mercedes' Michael Schumacher was fourth on 1:25.336. The session threw a lot of unexpected results with teams getting an idea of each others' performance for the first time. Defending champion Sebastian Vettel came up with the sixth fastest time of 1:25.668, his worst qualifying show since he took the same place in the Italian Grand Prix of 2010. His Red Bull teammate Mark Webber came fifth at 1:25.651. It was a disappointing return to F1 for Kimi Raikkonen as he was knocked out of the session in Q1 with 18th place. The Ferrari's of Fernando Alonso and Felipe Massa will start the 58-lap race on 12th and 16th position after the Spaniard mustered 1:26.494 with the Brazilian finishing a second slower than his teammate. It was a satisfying result for Force India's Hulkenberg, who is back to full-time race after a stint with the Williams in 2010. The German's best lap in Q3 was 1:26.451 while his teammate Paul di Resta managed 1:27.086 in Q2 for 15th place.